My name is Hor Sopheak, relatives and friends and guests call me “Haak” or "Pheak". I have been in Siem Reap near Angkor for more than a decade, I live here with some of my relatives close to the town centre. I started as an ordinary Tuktuk driver with a driving licence. 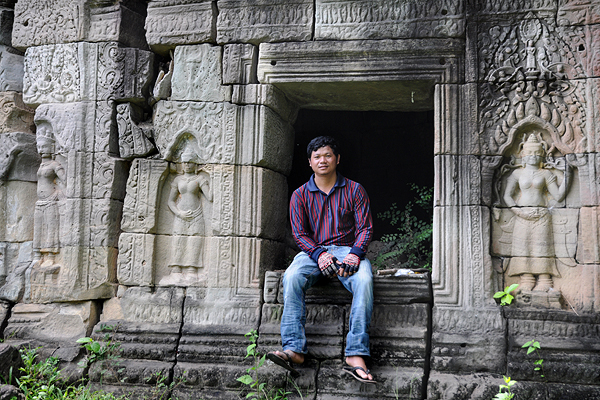 Now I also offer van or taxi tours from Siem Reap near Angkor to Koh Ker and other Khmer temple towns. My ambition is to show you the less famous sites, too, because many guests ask for tranquil places. 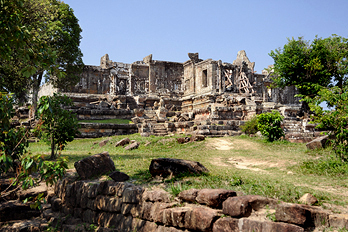 Koh Ker, Cambodia's second largest temple town, is highly recommendable in this respect. 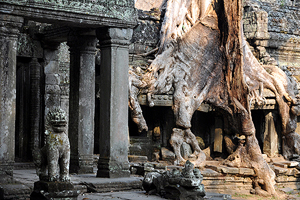 Other great destinations off the beaten track are Banteay Chhmar and Prasat Bakan (Preah Khan Kampong Svay). I am an experienced driver and try to satisfy my guests by offering good service for reasonable prices and avoid pushing them to shops or any activities they did not ask for, because only satisfied guests will recommend me, for example this website is created by a customer. I can speak English fluently, though not without mistakes. I cannot speak German or other foreign languages, but I could recommend other drivers or guides in Siem Reap speaking your native language. My main business are private tuktuk or van or motorbike day-excusions to Angkor temples and other places in the vicinity of Siem Reap, for example Roluos, Tonle Sap and West Baray or unknown temples such as Phnom Bok and Chau Say Vibol. 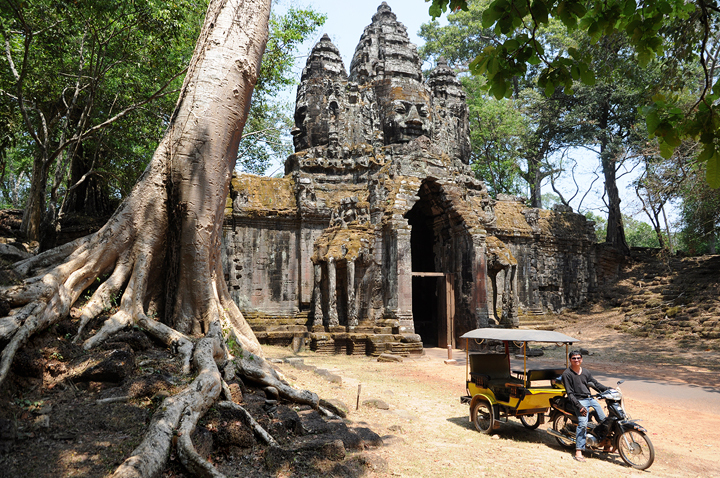 Usually tuktuk excursions, particularly Angkor's so-called Small Tour and Grand Tour, are my every-day business. 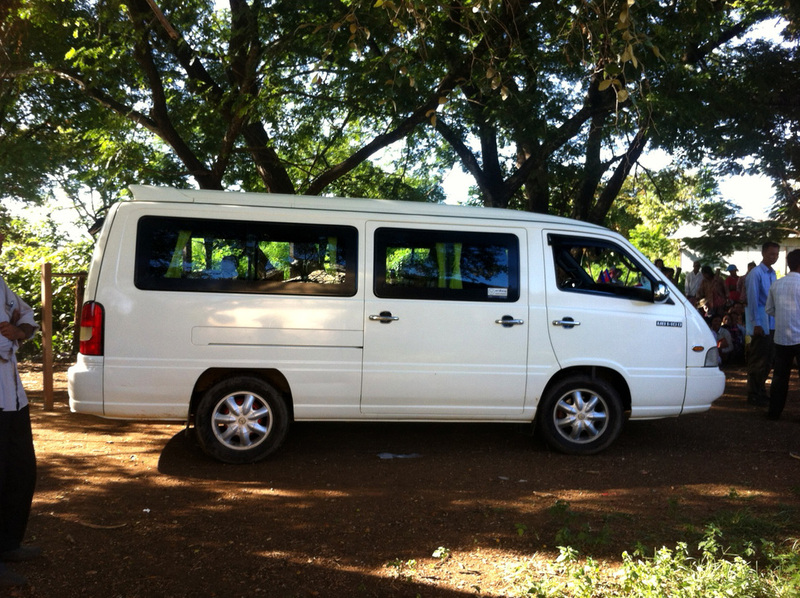 But I can offer more comfortable vehicles, too, for example for those who prefer A/C. I am experienced to assist travellers with special wishes and can offer transport to many rarely visited monuments that are, in some cases, not easy to find without the help of a local resident. In some special cases such as Phnom Kulen, Banteay Thom and small western Angkor temples, motorbike transport for only 1 person is the best choice, this means, you need 2 drivers for a couple. Otherwise you would have to consider long walking distances on small pathes, using the more comfortable vehicle only on the roads. 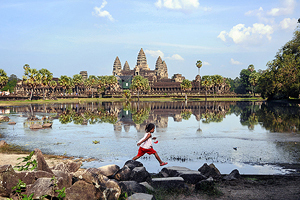 Much more information about Angkor Wat and surrounding temples is available on the comprehensive website Angkor-Temples. I very much appreciate to welcome regular visitors of Cambodia several times and sometimes can invite them to my hometown close to the Vietnamese border. My homeland is near Angkor Borei in the south-east of Cambodia. 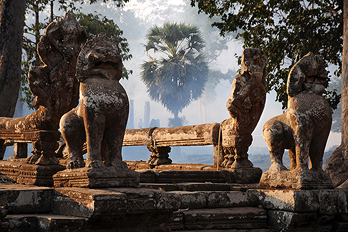 It is very close to the very first centre of the Khmer civilization, Phnom Da. In case you accept local food and simple clean accommodation with a shared local-style bathroom, you could stay with my family for a night or two, but most of my relatives do not understand English. For more information about stays with my family please click to my private tours page. I have been living with my family in Siem Reap for more than a decade now, but my hometown is Angkor Borei. Don't be confused, Angkor Borei is not close to Angkor, on the contrary, it is located in the very south-east of Cambodia, close to the Vietnamese border. Not many tourists visit this place. Nevertheless, for those interested in Khmer history, Angkor Borei is a famous place, too. It is Cambodia's most important city of the first indianised culture in mainland Southeastasia, the so-called Funan maritime empire. 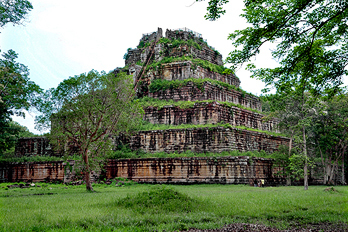 One interesting monument surviving from the following Chen-La period can be seen on the hill Phnom Da near Angkor Borei. 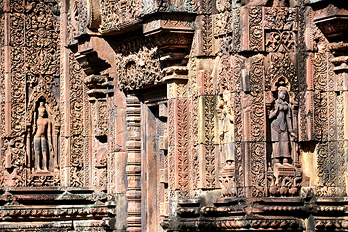 For a detailed account study the page about the history of the Funan period and the Phnom Da style. The distance between Phnom Penh and Koh Ker is 370 km via mainroad NH6 to Kampong Thom and then NR62 northwards, direction Preah Vihear. From Bangkok to Koh Ker the road distance is 510 km via border crossing Aranyaprathet/Poipet and mainroad NH6, crossing Siem Reap. 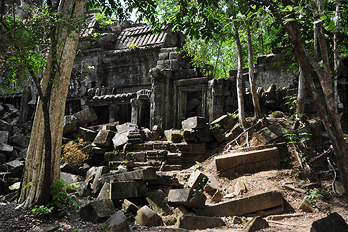 Beng Mealea (also transcribed Bang Melea) is famous as a large Khmer temple which is completely overgrown. 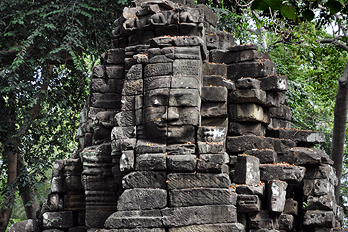 In size and style Beng Mealea is similar to Angkor Wat. 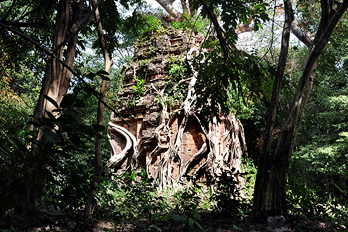 The trees inside the temple are less big but there are many more in Beng Melea than in Angkor's jungletempe Ta Prohm. 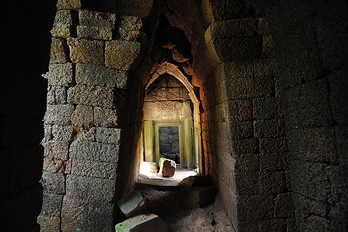 Beng Mealea is reachable on a half day excursion from Siem Reap. I can even organize it as a cheap Tuktuk tour. 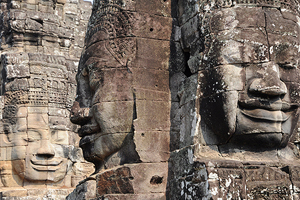 For details study the Bang Melea page on my Angkor temples website and for price offers please contact me.